HONOLULU (23 March 2017) The Western Pacific Regional Fishery Management Council concluded its three- day meeting in Honolulu today with a suite of recommendations, many of which are focused on keeping US fishing grounds open to sustainably managed US fisheries. The Council includes the local fishery department directors from Hawai‘i, American Samoa, Guam and the Commonwealth of the Northern Mariana Islands (CNMI), fishing experts appointed by the Governors and federal agencies involved in fishing-related activities. Marine national monuments, national marine sanctuaries, other marine protected area (MPA) designations and Department of Defense (DOD) training are among the uses that are increasingly closing off fishing grounds in US waters. Council Chair Edwin A. Ebisui Jr. Council clarified that Council communications to the Administration about impacts of marine national monuments on fisheries is not lobbying. Some environmental activists recently made misleading statements about this in regards to a letter to President Trump prepared on March 1, 2017, by the Council Coordination Committee (CCC). The CCC includes the chairs of the nation’s eight regional fishery management councils. The letter details the impact of designations of Marine National Monuments under the Antiquities Act in the Atlantic and Pacific Oceans and was submitted to the President after conferring with the NOAA Office of General Counsel. 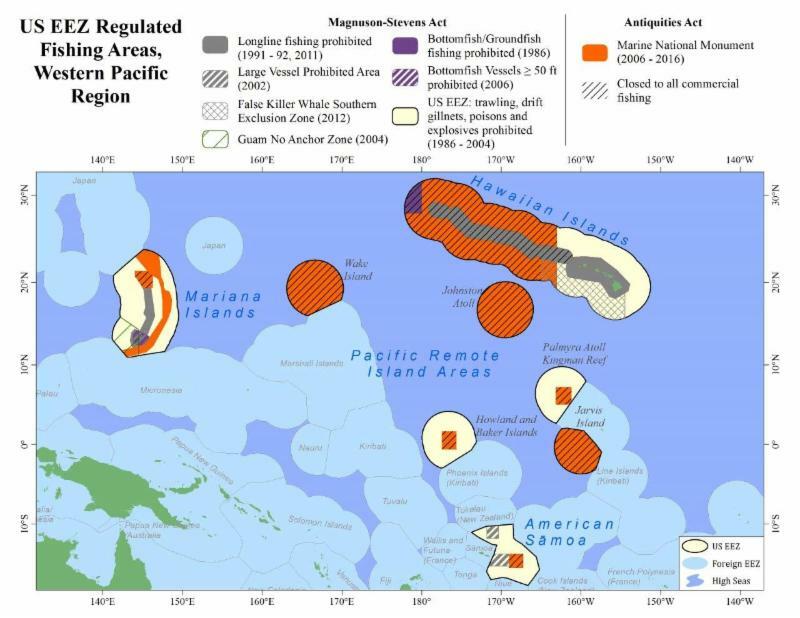 Direct the Council chair to request that the President remove fishing prohibitions within the Marine National Monuments in the US Pacific Islands, therefore reestablishing management of those fisheries under the authority of the Council and the Magnuson-Stevens Fishery Conservation and Management Act (MSA). The voting members of the Council agreed to this action, with abstentions by the State of Hawaii and Michael Tosatto, Regional Administrator the National Marine Fisheries Service (NMFS) Pacific Islands Regional Office. Ebisui noted that MSA requires not only conservation and protection of marine resources but also their optimal use. The United States imports more than 90 percent of the seafood it consumes with an estimated 30 percent or more from illegal, unreported and unregulated (IUU) fisheries. He noted the absurdity of US actions that support these IUU fisheries by closing off US fishing waters for regulated US fisheries. Council Executive Director Kitty M. Simonds noted that the Governors of American Samoa, Guam and the CNMI have already sent a similar request to the President. Communicate to the Secretary of Commerce concerns related to the proposal to overlay a national marine sanctuary on the Marianas Trench Marine National Monument, including the scope of the proposal, federal overreach, regulatory duplication and increased administrative costs. Council Member John Gourley (CNMI) noted that the two petitioners are the Pew Charitable Trusts and the Friends of the Marianas Trench, which was established by Pew in 2008. Council Member Va‘amua Henry Sesepasara, who directs the American Samoa Department of Marine and Wildlife Resources, said the American Samoa government is considering to request removal of the National Marine Sanctuary of American Samoa, in part because of its fishing prohibitions. Request that the National Marine Fisheries Service (NMFS) analyze the potential impacts on protected species from effort redistribution related to fishery provisions to prohibit commercial fishing in the Papahanaumokuakea Marine National Monument expanded area, 50 to 200 miles offshore around the Northwestern Hawaiian Islands, encompassing waters twice the size of Texas. Work with NMFS and NOAA General Counsel to review the US District Court’s decision regarding Large Vessel Prohibited Area (LVPA) and to evaluate next steps, which could include requesting the Court to stay the decision pending reconsideration or appeal of the court’s decision; and further, to provide regulatory relief for the American Samoa longline fleet because it continues to face dire economic conditions. Council Members Christinna Lutu-Sanchez, an owner of American Samoa longline vessels, noted that the longline vessels being prohibited access from the area are owned and operated by local American Samoans. Council Member Taotasi Archie Soliai of StarKist Samoa noted the importance of the albacore tuna caught by the local longline fleet and landed at the cannery. The cannery is the largest non-government employer in the Territory. A second cannery in the Territory closed earlier this year, in part due to difficulties with tuna landings. Request that the Guam Department of Agriculture and the CNMI Division of Fish and Wildlife report on the efficacy of the Guam Marine Preserves and CNMI MPAs to determine how they have met their management objectives. Reconvene the Bottomfish Working Group to develop a plan that provides options for opening the State of Hawaii Bottomfish Restricted Fishing Areas; and request the State of Hawaii develop guidelines for the closure of any area to fishing and consider, as a requirement of closing an area to fishing, the development of a plan that includes regular monitoring of the area and a periodic assessment to the determine if management objectives have been met. Request that the DOD and the CNMI, in their consultations on the continued use of Farallon de Medinilla for military training and testing, include the fishing community to determine appropriate compensation and mitigation for damage and loss of fisheries, noting that recent expansion of Federal Aviation Administration Restricted Airspace from 3 to 12 nautical miles around the island has further impacted the local fishing community through reduced access to prime fishing grounds and increased transit times. Request that the CNMI government evaluate the impacts to trolling and atulai (mackerel scad) fishing operations due to the anchoring of [military] prepositioning ships off the island of Saipan. Request that the DOD complete an inventory and assessment report of all military dump sites throughout the CNMI and surrounding waters. info@wpcouncil.org or phone (808) 522-8220. Western Pacific Regional Fishery Management Council: Secretary of Commerce appointees from nominees selected by American Samoa, CNMI, Guam and Hawai`i governors: Michael Duenas, Guam Fishermen’s Cooperative Association (Guam) (vice chair); Edwin Ebisui Jr. (Hawaii) (chair); Michael Goto, United Fishing Agency (Hawaii); John Gourley, Micronesian Environmental Services (CNMI) (vice chair); Christinna Lutu-Sanchez, commercial fisherman (American Samoa); McGrew Rice, commercial and charter fisherman (Hawaii) (vice chair); Dean Sensui, film producer (Hawaii); Archie Soliai, StarKist (American Samoa) (vice chair). Designated state officials: Suzanne Case, Hawai`i Department of Land & Natural Resources; Henry Sesepasara, American Samoa Department of Marine & Wildlife Resources; Richard Seman, CNMI Department of Lands and Natural Resources; Matt Sablan, Guam Department of Agriculture. Designated federal official (voting member): Michael Tosatto, NMFS Pacific Islands Regional Office. Designated federal officials (non-voting members): Matthew Brown, USFWS; Michael Brakke, US Department of State; and RADM Vincent B. Atkins, USCG 14th District.